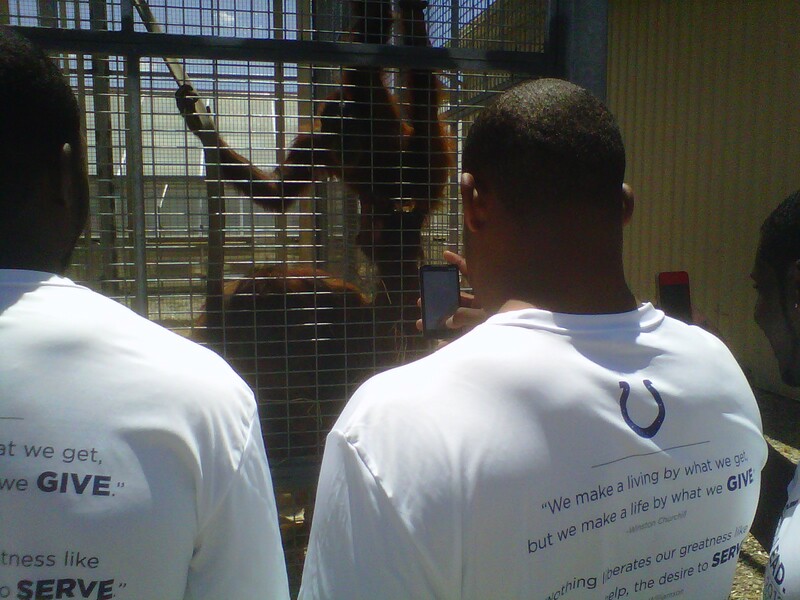 Members of the Colts rookie class observe an orangutan Friday afternoon at the Indianapolis Zoo. Within sight of their future home turf, the Colts 2012 rookie class took in another sight of Indianapolis on Friday afternoon. The Indianapolis Zoo welcomed the rookie class for a few hours on Friday afternoon as the players got a behind the scenes look at many of the most popular exhibits. For a majority of the players, a trip to the zoo brought back some childhood memories of attending their local zoos. “This is something I haven’t done since I was little and I’m sure a lot of the other guys haven’t had the time to go to a zoo so it was nice to get out and interact with the animals,” tight end Dwayne Allen said. Players were able to pet penguins, take part in interacting with dolphins used during live shows and get up close and personal with some orangutans. Even the 6’4”, 255 pound Allen was impressed by the size and IQ of many of the animals. The trip to the zoo was the fourth different visit the rookie class has made around Indianapolis this week and Allen said he believes the class feels very comfortable around each other. “They call it ‘rookie development/rookie engagement’ and we’ve spent a lot of time together getting to know each other’s personalities and that’s only going to help us grow closer, not only on the field but off the field as well,” Allen said. On a beautiful, sunny day in Central Indiana, the 2012 rookie class for the Indianapolis Colts showed that behind the rough and tough exterior of every NFL player, even the biggest, fastest and strongest men on the planet can still enjoy and appreciate a day that takes them back to their childhood. For rookie wide receiver T.Y. Hilton, the opportunity to take a step back from the whirlwind that is life in the NFL was one that afforded him the chance to unwind and have fun with teammates. The Indianapolis Zoo put forth its best foot on Friday in playing host to the young, fresh faces that have been added to the Colts roster, as they supplied the team with a behind-the-scenes look into what makes the zoo such a popular destination for residents across the state. One of the major attractions throughout the day was the orangutan exhibit. Enamored with the opportunity to watch and interact with the orangutans, just as a child on his first visit to the zoo, Hilton and his teammates were captivated by the primates. For each rookie, a trip to the Indianapolis Zoo gave them the opportunity to see what the city of Indianapolis is all about. From the residents that help provide the state with a friendly environment to the care and quality applied to each popular destination, the city of Indianapolis certainly makes up for its lack of size with a sense of pride and ingenuity. Fellow rookie wide receiver LaVon Brazill has found the city to be every bit as amiable as he hoped it would be, and grown even more excited about what his future in Indianapolis may hold. Wednesday was a big day for Tiny and the rest of the Colts marketing crew as we headed three hours north to LaPorte, Ind., home of the Slicers. What exactly is a Slicer? I’m still not exactly sure, but I do know that the Slicers showed up in full force for Wednesday’s Fan Fest. While we managed to entertain ourselves throughout the lengthy car ride with various “Call Me Maybe” remixes and some old school rap jams, we all felt a little sluggish by the time we arrived at LaPorte High School. However, there were several volunteers ready to help when we began to set up for the event. Water, crowd control, you name it: these Colts fans were ready to step in wherever the need may be. Thank you, volunteers! I met with some fans while they waited in line to visit with our sponsors, register to win free tickets, sign up for one of the Colts Official Fan Clubs and most importantly, meet the Colts players and cheerleaders. There were blue wigs, countless Colts jerseys and even a man sporting his Colts pajama pants. Avery, a six-year-old from LaPorte, waited in line prior to the gates opening so he could show off his fresh blue Mohawk to some of his favorite Colts players. Avery remembered traveling down to Lucas Oil Stadium to watch a Colts game a few years ago. “I’m not sure who the Colts played, but I know that we won!” While his semi-permanent hair color may not last until the season starts, Avery assured me that he’ll still be cheering for the Colts come September when we kick off the regular season against the Bears. Finally, a limo arrived with the cheerleaders and a bright red helicopter swarmed over the field carrying Colts players, Pat McAfee and Joe Reitz. Fans cheered and pointed to the sky, barely containing their excitement. Colts punter, Pat McAfee welcomed all of the fans to Wednesday’s Fan Fest and thanked them all for their support. McAfee said, “Colts fans are the BEST fans.” But we already knew that, right?! Before McAfee and Reitz had even signed their first autograph, the line stretched throughout the football field and out into the parking lot. Fans endured the long wait in the scorching sun with live music from the Jai Baker Band and competing for t-shirts tossed from our very own, Blue. Our good friend, Tiny (a 30’ inflatable mascot, in case you haven’t met him), welcomed kids of all ages to our Play 60 zone that included the Colts bounce house and inflatable slide. Colts fan Brock told me he was so “COLTSTRONG” that he could tackle Tiny to the ground. While Brock aced the quarterback challenge and sped through the drills in the Play 60 zone, he was only a little more than three feet tall, compared to Tiny standing at 30 feet tall. However, when you’re “the strongest kid at the Fan Fest” you can do anything you set your mind to. It was obvious that fun was had by all that attended the LaPorte Fan Fest. By the time the sun began to set and the line finally started to dwindle, the helicopter was swirling above the field waiting to take McAfee and Reitz back to Indianapolis. McAfee tweeted to his followers that it was his first time riding in a helicopter. I’ve never ridden in a helicopter either so I’m hoping that they’ll consider allowing Tiny and I to ride down in a chopper of our own to our next Fan Fest event. Before leaving the Fan Fest, Reitz showed his appreciation for the hundreds of Colts fans that came out to the event. “We’re nothing without our fans,” he said. Although it was a little warm outside, it was nothing a cold bottle of water couldn’t fix. Thank you to the LaPorte High School cheerleading squad who spent their evening making sure fans stayed hydrated! I had a great time getting to meet our fans that cheer on the Colts from nearly 150 miles away. We’re glad we could bring some Colts blue spirit up north! Get ready, Kokomo – we’re headed to you Friday! And Rushville – we’re coming your way Saturday! When it comes to eating steak, Josh Chapman feels right at home. Chapman, the Colts fifth round draft pick, was in his comfort zone on Thursday night as he and the 2012 rookie class headed down to St. Elmo Steak House to experience one of the most iconic restaurants in Indianapolis. The evening included a brief etiquette eating class, which preceded the steak-filled dinner. It was the first time Chapman had been to the famed restaurant but the partnership between the steak house and Colts players dates back almost 30 years. Co-Proprietor Craig Huse welcomed the rookie class to St. Elmo on Thursday evening and hopes the connection between the two continues for years to come. “To have the players here in their first week or so in Indianapolis is great for us to be able to introduce them to this restaurant, which is such an important piece of Indianapolis,” Huse said. The past week has been about the Colts rookie class getting acquainted with their new hometown. Near the end of the dinner on Thursday, the camaraderie between the first-year players could easily be seen as the players were joking back and forth between each other. The rookies will get some time away from each other starting next week before gathering for their first ever NFL training camp on July 28th. With all different storylines and from all over the country, the rookie class is slowly turning from a group of individuals becoming a single, cohesive unit. Come September, Colts fans will once again fill the Illinois Street restaurant to watch that family start a new chapter. The Colts running game hasn’t given any opposing defenses any nightmares since the haydays of Edgerrin James. Ever since his departure, the team has relied on 90% of the arm and brain power of Peyton Manning, and 10% of “running back by committee.” Enter 4th year RB Donald Brown. According to the critics, Brown has been deemed a “bust” due to the lack of his production since joining the team. These opinions are being made by people who are only looking on the surface of his career. When I look at Brown, I can’t help but be reminded of another RB who’s career didn’t start off well with the team who drafted him either, but went on to be a bell cow for two other NFL franchises he played for: Thomas Jones. Jones was drafted by the Cardinals in 2000. He was even dubbed the top rated RB coming out of college that year. He didn’t play like it for any stretch of his career while in St Louis. After a one year stint with the Bucs that saw his YPC go from 3.7 in St Louis to 4.6 with the Bucs, he landed in Chicago. With the Bears is where his career took off as a RB. For 3 years Jones’ production increased considerably from what it was with the Cardinals (511yds in 2002 for the Cardinals vs 948 yds in 2004 for Chicago). 2 of those three years he rushed for over 1200 yards. In 2007 he went to the Jets. His production with the Jets climbed each year he was there as well with his best year coming in 2009 where he rushed for 1400 yrds. The point I make with this comparison is one that simply suggests given the right situation with the right team, a player who has been a “bust” for one team can also be a gem for another. Now even though Brown is still with the Colts, in essence its as if he is playing on a different team due to all of the changes that have taken place with the organization: New coaching staff, new players, new scheme. Technically, Donald Brown is on a “new team.” That is why I feel he will have his most productive year in the coming season for the Colts this year. The offensive line will be bigger than the one he has played behind for the majority of his short career. The men coming in to replace what was here before are better than what we had before. Donald Brown as well as all of the other RBs are going to have running lanes that they didn’t have previously. Scheme is more important than overall “talent.” No one exemplified this subtle truth better than former Broncos and current Redskins Head Coach Mike Shanahan. In Denver, it didn’t matter who Shanahan had in a RB, they all ran for over 1000 yards in a season. He even got that kind of production from a former Post Office worker in Mike Anderson! That being said, when it comes to assessing what kind of RB Donald Brown will be considering what he had to work with coming into the league vs the potential of what he could be with what he has now, calling him a “bust” based upon those circumstances would be inaccurate. The best approach to take on this would be one that says: “Just wait and see.” Brown has flashed great potential when given the opportunity. The problem is he just hasn’t been given enough of them as well as not having the best of O lines to work with either. Add the season ending neck injury to Manning and you have another year lost due to ineffective play from the QB position. All of that should change this year. With the new additions on offense starting with Andrew Luck, coupled with the improved emphasis not only on the running game, but also the pieces in place to make it all work, I expect a breakout season for Brown that will have his naysayers lining up to get his jersey.